Over the years our company we have created a unique manufacturing technology products. Continuous monitoring of the emergence of new products in the manufacture of inflatable boats and immediate implementation of the most innovative and interesting of them, allows us to always stay one step ahead. Most of the details of which are collected by our boats are made specifically for us. Changes in some of the traditional components produced by our orders are unique. All this as well - the same material used in only the best manufacturers, and use only the best of their development, allows us to produce some of the highest quality inflatable boats in the world. 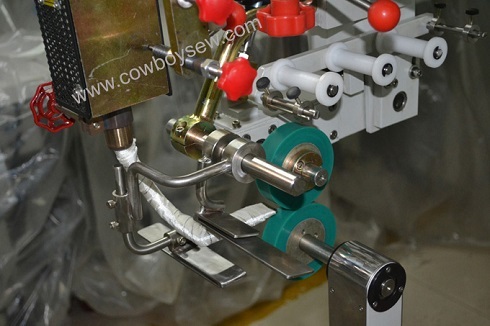 Welding machine, used by us in the production, designed specifically for tissue welding PVC. An electronic control system, which is equipped with a device makes it possible to precisely control the maximum air temperature and the rate of transport tissue, which eliminates overheating, and therefore the destruction layer of PVC on the material. Welding joins materials are considerably higher, the adhesion is considerably higher than when gluing. This method is best suited for the manufacture of inflatable boats. This saves the properties and characteristics of the original materials. Do you want to start their own production of PVC film? Welding of plastics in plants for hot air welding is exactly what you need. High quality weld is achieved by multi-functional systems for welding. Welding of PVC films can occur as a rod or overlap, while dramatically saving time and manufacturing strength. Distinctive features of the weld PVC film at the facility offered by us are digital control over all installation options and customizable control of air flow; rollers are made of stainless steel, and their speed can be adjusted on the fly, is fed to the nozzle is clean and dry air, it is possible use on-board computer for communication. Welding of plastics overlap occurs as follows: take two sheets of film that are stacked overlap, respectively, is heated above the lower leaf surface and the upper surface of the sheet below. Hot air enters through the nozzle into the space between the sheets, then use the roller sheets are pressed together immediately after heating. When welding rod system is almost identical. However, in this case, the welding of PVC film used with the filler material. As a result, you get a perfect product from PVC film with a minimum of manpower and time. Hot air welding seams boat. Very often, inflatable boats are made of PVC or other polymeric material. It is proved that the production of inflatable boats with hot air welding is the best, because the seam welding is more robust and reliable. Equipment for the production of inflatable boats made of PVC fabric allows you to eventually get a high-quality boats, which have high strength, durability and resistance to wear. A device for hot air welding allows for perfect stitch for a minimum period of time when it is full of all k4ontrol ongoing process. As a result, you get a boat, on which the seams are practically invisible. When welding, hot air is heated in contact plastic materials. Layers of weld material is passed through the equipment for welding, and in the place of contact between the layers fed hot air. Due to the pressure rollers and heat from the air, the layers of plastic are joined into a single mass. One of the main advantages of the production of inflatable boats such methods is the ability to weld materials of various shapes and lengths. We recommend the use of manual welding. Through it, you can get a very accurate and durable product. Do you want to get high-quality inflatable boat with strong seams? Then use the facility for hot air welding, you will not miss that. For the manufacture of cylinder joints Boats "Kolibri" the technology of hot air welding. This technology provides high-quality appearance of strong flat seams for one cycle, while ensuring fast and uniform heating of the materials to be welded over the entire thickness in the field of welding. The result is a heavy-duty, sealed seams, resistant to excessive loads and temperature extremes. Hot air welding is the most efficient method of welding of thermoplastic materials. Welding is done by hot air at the junction of the material. In the weld zone is blowing hot air, which is due to heat transfer. Hot air is fed through a special nozzle designed so that the material is heated before it enters the zone of welding. With this approach, there is a decrease of temperature stresses in the material, and therefore improves the quality of welding. Hot air welding can be carried out as manual and automatic equipment, depending on the manufactured product. When welding with hot air, the formation of two types of e stitches: single and double continuous suture. The most commonly used single joints, but sometimes, when you need to create the most hermetic products apply a double seam. Hot air welding has a number of significant advantages: seal strength does not depend on climatic conditions and human factors; welding is significant savings of time resources, the welding is possible to continuously monitor the process. 1).Hot air welding work best for bonding long, continuous lengths of tape. 2).Hot air welding is fast and consistent. 3).Provides streamlined finish to product, resulting in a professional appearance Inflatable boats are big and with unique shapes, it is almost a necessary to have large welding machine with rotary arm if you are to make various curved seam on foldable inflatable boats or rigid inflatable boats.